Born in Kinshasa, Zaire in April of 1972, Lolenga Mock is arguably the toughest, grittiest “old man” in boxing today – and the super-middleweight/light-heavyweight is largely operating under the radar. 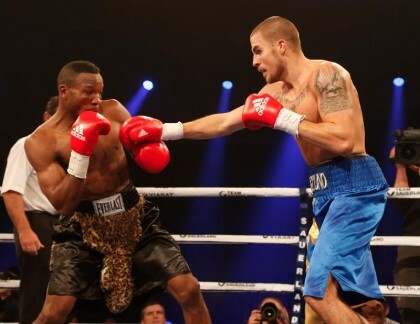 Yesterday in Copenhagen, Denmark, Mock upset former interim WBA middleweight champ Dmitry Chudinov via close but unanimous ten-round decision. With yesterday’s win over Chudinov, Mock won for the 11th time since dropping a decision to Erik Skoglund in a European Union light-heavyweight title fight back in October of 2013. Who knows how much further Mock can go, or for how long, but he has to be credited with being one tough, proud and quite remarkable fighter. A pro since May of 1991 (!) Mock has won European titles at 168 pounds as well as an EBA strap at 175, and he clearly still wants more. Mock has some kind of chin, he is always in top shape and he will fight anywhere: Canada, UK, Germany, Denmark, Poland, Italy and Kenya being among the places Mock has faced quality opposition. Among those top names who failed to put a dent in him are: Charles Brewer, Lucian Bute, Mario Veit, Skoglund, Patrick Mendy and now Chudinov. Mock is a low-key kind of guy but he sure deserves to be given a ton of credit and a share of attention. It turns out David Haye stopped one tough nut all those years ago. Previous boxing news: Deontay Wilder vs Anthony Joshua: A modern day Foreman-Lyle! ?